All of us, at one time or another, have had food made from ground corn, be it cornbread, corn tortillas, tortilla chips, tamales or polenta. In my pantry there is a new kid on the block called pre-cooked white maize meal or “harina de maiz blanco precocida”, which is what I used to make my arepas. The first time I made them, it was a totally new tasting experience for me. Nothing like cornbread or corn tortillas. 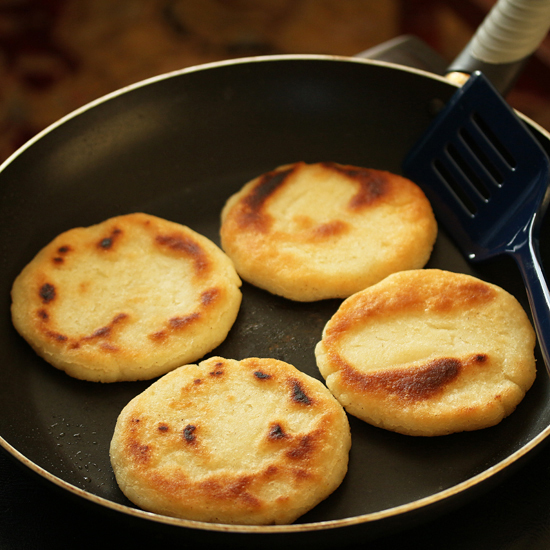 Arepas taste like corn on the cob, ground up and fried in patties. Crispy on the outside, soft and fresh corn flavored on the inside. 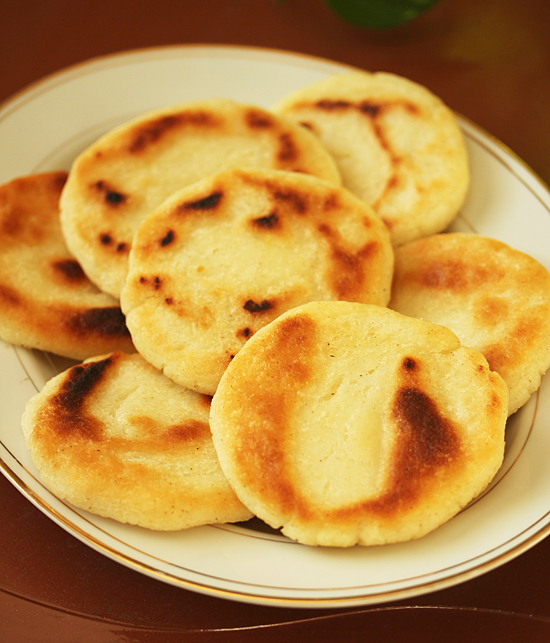 Arepas are unleavened flatbreads made from masarepa, a precooked corn flour prominent in the cuisines of Venezuela and Columbia. They are eaten daily in those countries either with accompaniments such as cheese and avocado, toppings, or split to make sandwiches. Popular fillings are shredded skirt steak and cheese, chicken salad with avocado, pulled pork, chicken and cheddar, or black beans and cotija cheese. 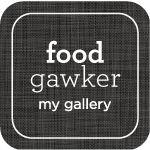 I filled mine with picadillo, red onion and avocado, and another day with fried egg, bacon, red onion and tomato. No matter what you fill them with, that fresh corn flavor shines through. Cornmeal, used for cornbread and polenta, is ground dried corn, which may or may not have the hull and germ removed. It is not pre-cooked. Masa (hominy), used for tortillas and tamales, is dried corn that is soaked and cooked in an alkaline solution, usually slaked lime or wood ash, a process called nixtalmalization. It is then hulled, and can be eaten as hominy. Or dried and ground, becoming masa harina, which can be made into a dough by adding water. Masarapa (maize flour) is made from corn kernels that are cooked in water, peeled and dried, then ground into meal or flour. The most popular brands are Harina P.A.N. in Venezuela and Areparina in Columbia. 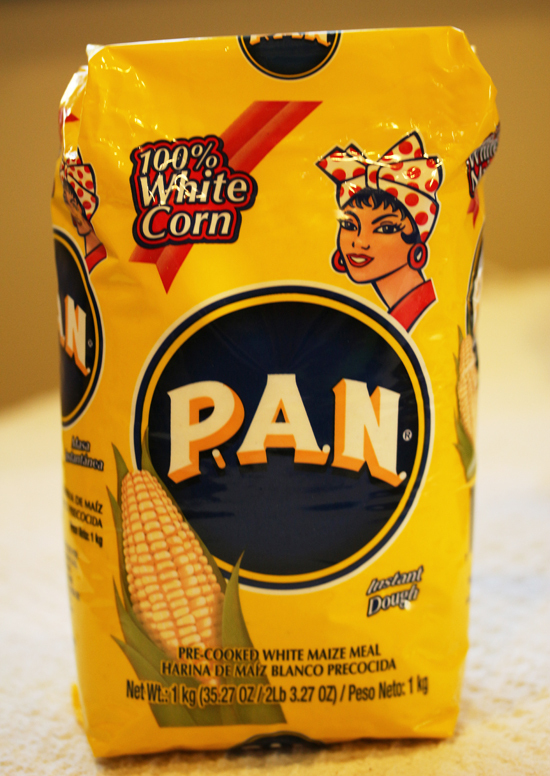 Look for the words “harina de maiz refinada precocida” or “refined pre-cooked white maize meal” on the package. I found my P.A.N. corn flour at Super A Foods, which has 12 locations around the Los Angeles area. I began by googling “Mexican and Latin American markets Torrance.” Then I called several before I located one that had it. The corn flour is mixed with salt and water to form a dough. It is rolled into a log and cut into 8 pieces. Each piece is rolled into a ball and flattened into a disc about ¾-inch thick. The discs are cooked, covered, in a little oil, until golden brown, then turned over and the second side browned. This method works just beautifully. After the arepas cooled a little, they were delicious with just cold butter. Or you could slit them in half and fill with your favorite sandwich fixings. I didn’t cut them in half all the way through, but sliced the bottom half only on the inside, maintaining the closed edge. 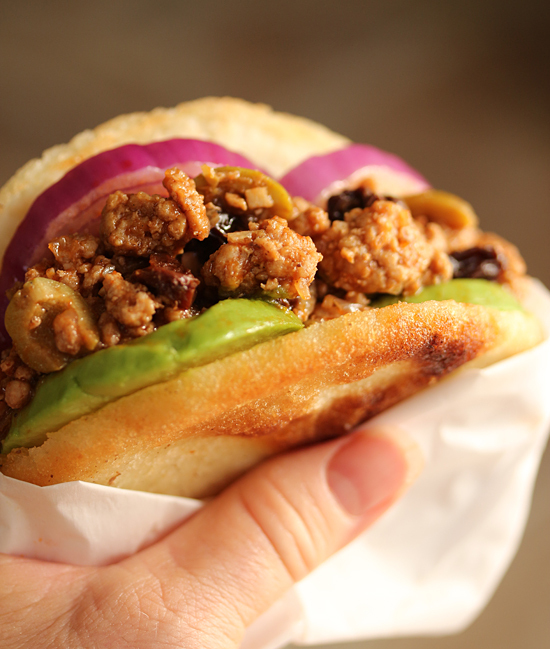 After filling my arepa with Picadillo, which is ground pork in a tomato-y sauce with green olives and raisins, plus sliced red onion and avocado, I half-wrapped the whole thing in parchment paper to make sure nothing fell out. Oh man, it was sooooo good. 1. In a large bowl, mix the arepa flour and salt with 2 ½ cups warm water. Stir until no dry lumps remain and dough holds together when squeezed. 2. 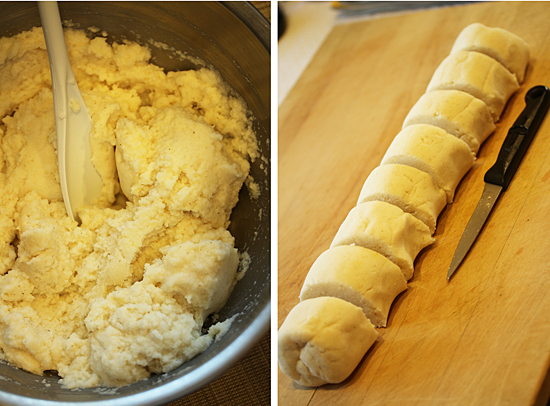 Let sit 5 minutes for dough to absorb water throughout. 3. Knead dough in bowl a few times to form a ball. On work surface, form into a log about 12 inches long and cut into 8 pieces. 4. Roll each piece into a ball and flatten each into a disc about ¾-inch thick. 5. In a large non-stick skillet, heat 1 tablespoon oil over medium heat. 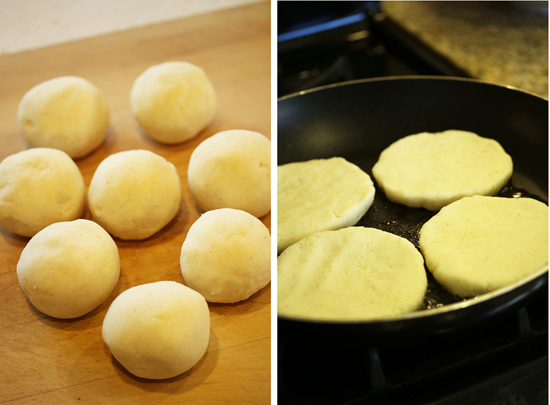 Add 4 arepas, cover and cook until golden brown, 6-8 minutes. Flip and cook uncovered until other side is golden brown. Repeat with remaining oil and dough. 6. Transfer to paper towels to cool. 7. Slice arepas half way through with a serrated knife. Slit open bottom half only on inside, leaving edge intact and together, to form a pocket. 8. Stuff with desired filling. Eat as though in heaven. Note: To freeze, wrap each arepa in plastic film in a large zip-close freezer bag, for up to 2 months. I had these wonderful treats in Columbia last year. I am so excited to make this. I loved the cheese filled ones as well. This is fascinating. I have never heard of Arepas before. I confess to a complete lack of knowledge of Venezuelan cuisine – so this has really caught my attention. I bet they are delicious. I love corn – whether it be on the cob, or made into flour and then used as a component of something else. I want to try these. Thanks for the enlightenment! I’d like to find out where did you get that white precooked corn masa. Would you please let me know. 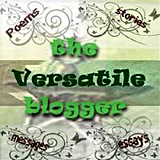 Enjoying your blog a few months now and I love it. Thanks for sharing all those wonderful recipes with us. My wife and I are looking for a mold to make perfectly flat, round Arepas. A local supplier who sold us these frozen and packaged in plastic bags with small sheets of plastic between them has fallen ill. We would like to make our own, but are unable to find either molds or a reasonably priced machine that would turn these out. Thanks for advice about where to buy.